I tried out the New->Form Snapshot on an existing Swing application, and ran into a few problems. On the main console frame of the application which has extensive JMenuBar with many JMenus, it only captured the JMenuBar. Maybe I was expecting too much from this. I though it could pull in the entire menu. I was even thinking it might find the callback code (since it is all available in my project), and record all the bindings for the menu items. I did get a couple errors on a few dialogs: See attached. 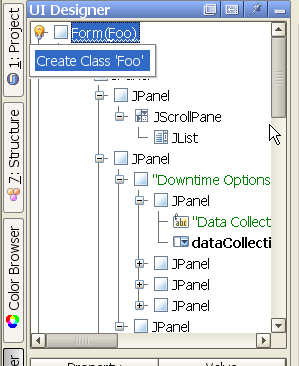 Issue #3 Unknown layout manager classes found. javax.swing.plaf.basic.BasicOptionPaneUI$ButtonAreaLayout Components using these layout managers iwll not be included inthe snapshot. Continue? I don't know if it would be possible to detect when JOptionPane is being used, and record it as such. But you don't have JOptionPane on the palette. A> and ran into a few problems. A> bindings for the menu items. will be added in the next version of IDEA after 6.0. A> at least at first glance. A> I did get a couple errors on a few dialogs: See attached. A> they use JGoodies to create the button panel. such an exception could happen with a standard version of JGoodies Forms. A> Issue #3 Unknown layout manager classes found. A> using these layout managers iwll not be included inthe snapshot. that comes bundled with IDEA. Will try that next. I took one of the Dialog I captured from the Form Snapshot and then tried to bind a class to it and so forth. After you take a form snapshot, it shows up as Form1.form, Form2, form in the package you did New->Form Snapshot in. nice except that by default it creates the new class with no package. I think this should be changed so that if you don't specify a package, then it should default to the package where the form resides (unless the form isn't in a source directory...). Furthermore, I don't see why you don't just go ahead and generate this class automatically, so someone doesn't even have to do this step. So, I have a form Form1.form bound to class com.abc.apps.util.Form1. After I bound the dialog to a class, and then named all the fields. 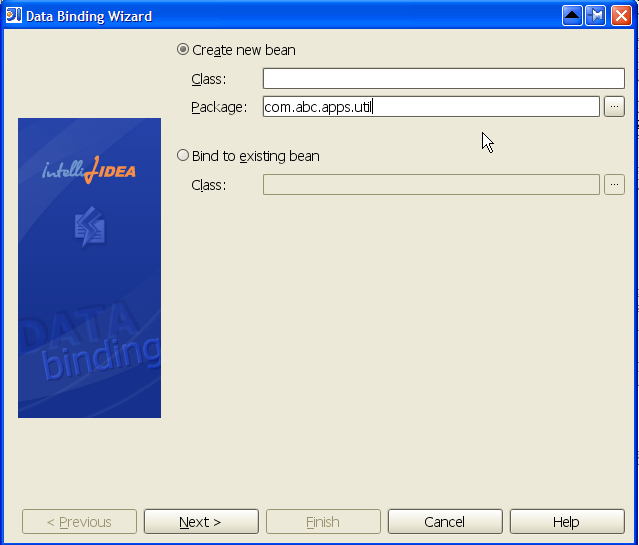 Then I tried the Data Binding Wizard. form's class? That would be the simplest thing to do. After associating Form1 as the bean class, it then showed me the fields I could bind. even though I had given them names. this easier the case when you are creating this from scratch. Couldn't you just fill in th bean name to be the same as the field name? build. Is there a way to just have UI Designer generate the code? Okay, maybe I'm an idiot, but that Data Binding Wizard didn't do what I though it was going to do. a getStartDate() which returned startDate.getText(). 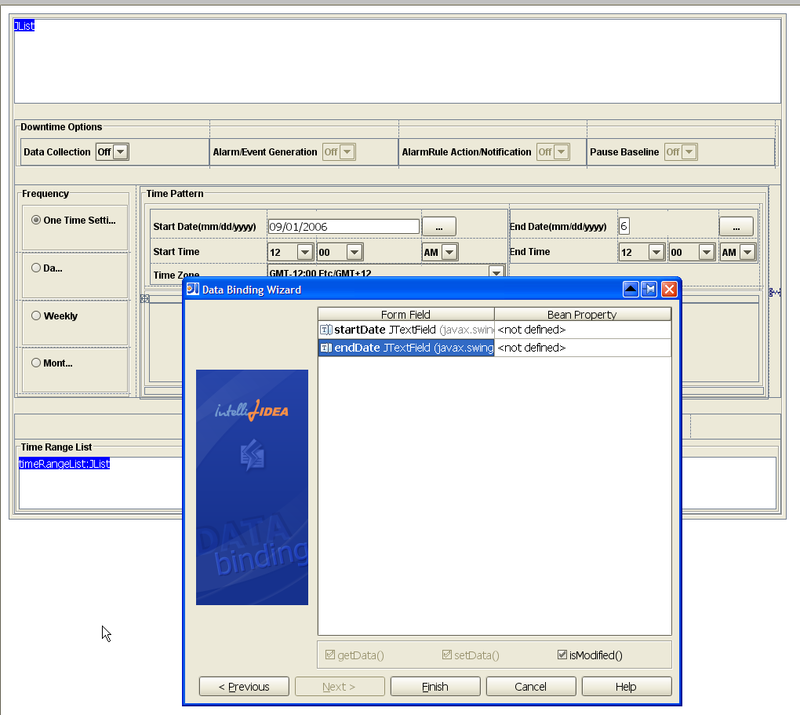 (startDate is a JTextField).